Our Chapter Quilt made in 1996 under our former name of the Detroit Metro Chapter. 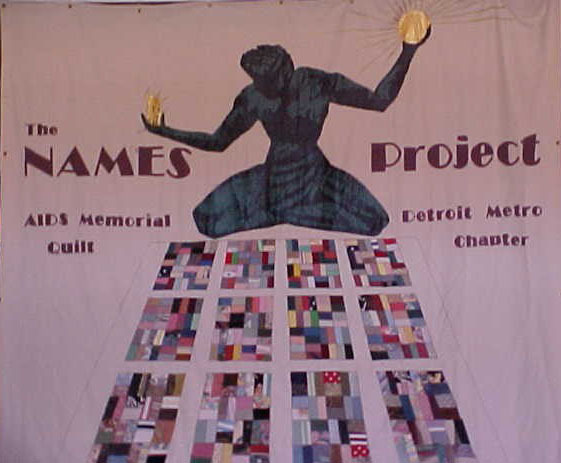 The NAMES Project AIDS Memorial Quilt was founded in 1987 as a caring response to the AIDS epidemic. As the largest community art project in the world, the Quilt is composed of over 46,000 cloth 3'x6' panels, each beautifully and colorfully decorated with the name of at least one woman, man, or child who has died with AIDS. Panels are made and donated by friends, spouses, parents, children, or other family members--anyone who has lost someone to this terrible, and as yet incurable, disease. Officially recognized as a National Treasure in 2006 and nominated for a Nobel Peace Prize in 1989, The Quilt is both an uplifting memorial to those who have perished, and a compassionate support to all living with or affected by HIV and AIDS. As do other Quilt chapters throughout the United States, the Michigan Chapter assists people in making panels for loved ones, and displays small portions of The Quilt locally to enhance AIDS awareness, education, and prevention. The Michigan Chapter has been actively working with the AIDS Memorial Quilt through Quilting Bee's, Displays and other awareness events for over 20 years! We will have 29 Quilts on display throughout Michigan. Contact us to host a portion of the AIDS Memorial Quilt.